Money has always been tight for Diana Vashti. While studying poetry at Michigan State, she racked up $20,000 in student loans and eventually dropped out. But while Vashti was working at a craft store in San Francisco, her roommate, a software engineer, introduced her to websites that taught programming. Vashti, 31, decided she wanted to become a coder. She looked into coding boot camps, short intensive programs known to be a fast track into software development. But most come with a hefty upfront price tag of $8,000 to $30,000. That was out of the question. Then Vashti clicked on an online ad for Learners Guild, a 10-month developer program located in downtown Oakland. 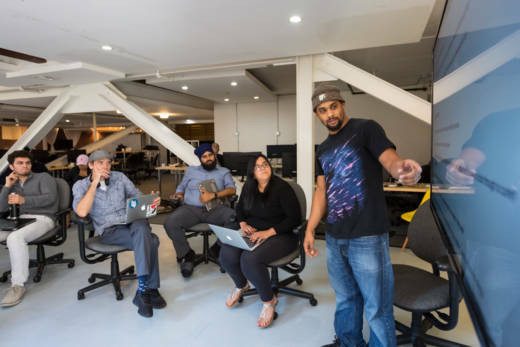 The program is one of a handful of coding schools that offer “income-share agreements,” which means students don’t have to pay until they get a job making more than $50,000 a year. And depending on their salary, graduates will fork over 12 to 20 percent of it for three years. The coding school also offers a monthly stipend. For Vashti and the other students at Learners Guild, the stipend and income-share agreement allowed them to pursue a career change. “It was well out of my financial ability to go into any of these [other] programs,” Vashti said. Learners Guild president Ian Inaba believes that by using this income-share agreement model, the school removes barriers that can keep women and people of color out of tech. He said that the school is more diverse than the tech industry at large -- 50 percent of students in the program are African-American and Latino, and 35 percent are female. “There’s no reason why there aren’t women or African-American, Latino programmers,” Inaba said. Mark Dinan is a software engineer recruiter who works for some of the biggest companies in Silicon Valley. He agrees with Inaba that there should be more diversity in tech. But he cautions that training isn’t the only issue keeping tech companies from hiring diverse workers. The ride-hailing company has come to symbolize this culture problem. Susan Fowler, a female engineer who recently left Uber, wrote a blog post detailing sexual harassment and gender discrimination at the company. Back at the Learners Guild, Vashti is more than halfway through her coursework. As she considers entering the workforce, she’s aware of the cultural problems at tech companies. “It’s a major concern and probably why I didn’t get into tech sooner,” she said. Still, Vashti is hopeful. She believes if she takes her time when looking for jobs, she'll find the right fit.